Maybe I am just overly excited but oh well. So... I did a lil shopping for something exciting coming up in just a few months. Obviously as you can see from the title and picture above, this would be a different haul from what I used to talk about in this blog. I am stepping up into a whole new journey and I am pretty much excited but scared at the same time. I don't know what it is going to be after this but I am pretty sure it is going to be great and in shaa Allah I can do this! Also as you can see from the color scheme above, we are expecting a boy. haha! No kitchen set or bows and ribbons for now. Maybe in the next 5 years haha! So there were holding a baby expo at Danga City Mall here in JB. Mr and hubby thought of going. So we went yesterday and of course the crowd is crazy. When I went in I was so overwhelm by the crowd and choices of stuff. Luckily my mother in law come along to guide me on what to buy. So here are some of the stuff I got! First of all I wanna show you on the most cutest thing I ever picked. Of course its a clothes, it is one of the most exciting things to shop for a baby. It is this cute baby clothes set. 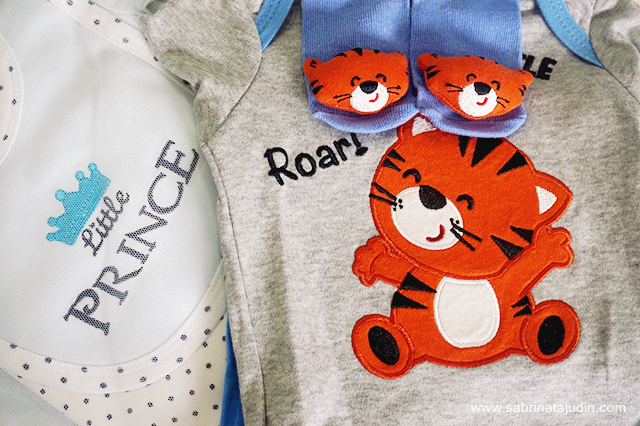 It is this 5 pcs set baby clothes and this little cute tiger baby clothes set. 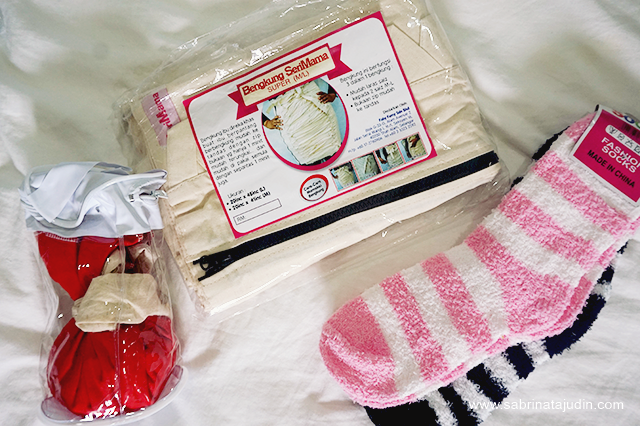 The socks has a beads in it which makes a sound when you shake it. Super cute I die. Haha. Also we got a pretty good deal on the Fiffy section where they have these combo set of 3 baby clothes for only RM30-RM30. Then I got some "kain bedung" I don;t know that I need these, but my mother in law said these are the baby essential. 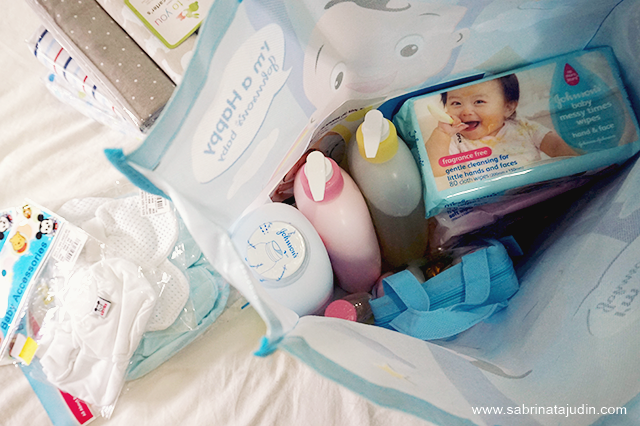 As a first timer, I learn alot about the baby stuff which not only clothes and bottle. There are a lot of other stuff too. So we got a few of the "kain bedung", these days they have in so many patterns where during in our parent days, they just use white cloth. How lucky today kids are! 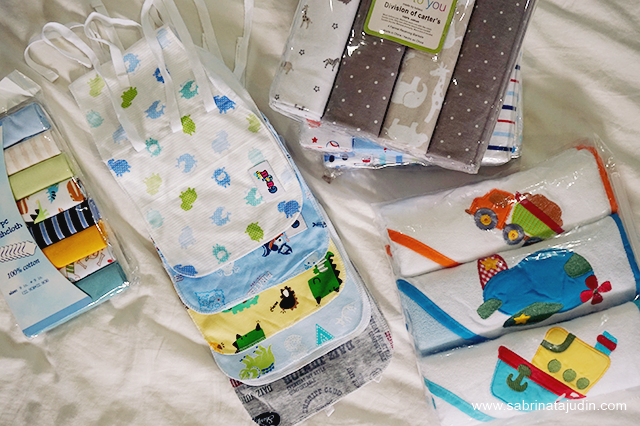 Also so napkin and some cute hooded baby towels. Aaa so cute! Then I got some washing essential. These are a started pack combo which consist of shampoo, body wash, powder, wipes and more. Is it true about that Johnsons "dangerous chemical" rumors? Ugh, I'm not sure.. :( Also I got some other essential such as bath tub, mats, pampers (we got a pretty good deal for mamy poko!) and more. We still need to get a few things. But maybe we will go to the supermarket or baby shop to bought the others stuff. The expo were too crowded and it was pretty tiring! Then here is the not so cute stuff but I need it. Haha. It is my post natal stuff. I got this bekung, some socks and these herbs thingy. I don;t know what it is, nevermind. I'll learn later. 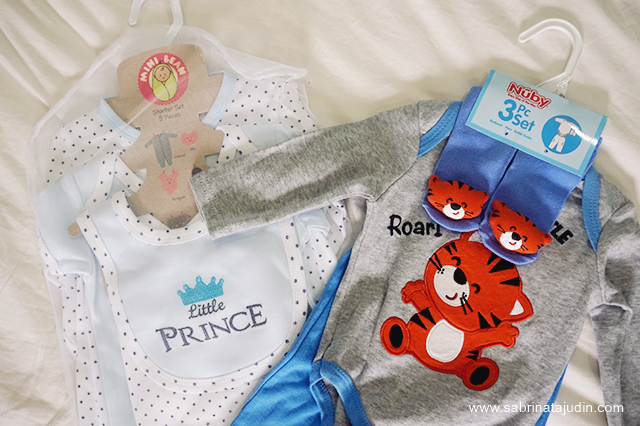 I love the tiger set too, so cuteeeeee <3 Baby expo mmg always crowded, x larat nak redah dah T_T Now I prefer buying baby stuff at one stop centre like Manjaku (not sure if JB ada outlet dia) the price is slightly cheaper than other baby shop too! comel kan brg2 baby ni.. I pun tak terkawal nafsu nk membeli brg baby.. hehe..
hi sab! i baru perasan entri u yang satu ni.actually my opinion lah kan,better kalau u tak guna losyen/mandian bla bla tu yang mengandungi paraben tau.kalau tanya i,i akan suggest pigeon yang sakura tu. SLS and paraben free. i pun belikan baby i tu..tapi tu pendapat i la..hihihi..semoga semuanya dipermudahkan..